The world's first personalised air quality monitoring system is using federated data to help Tasmanians breathe easier. Suffers are adapting their behaviour and managing their daily activities, as well as improving public health outcomes. Environmental conditions such as air quality and weather can have a major impact on our health. The AirRater smartphone app was created to assist people suffering from hay fever, allergies, asthma and other lung diseases like chronic bronchitis. The AirRater app provides a globally unique integration of air pollution, meteorological and allergen data with health symptom reporting. It integrates real-time data from a high resolution pollution, meteorological, and pollen monitoring network across Tasmania into the platform and interpolates the data so that AirRater users can quickly understand current environmental conditions. Since October 2015, more than 1000 Tasmanians have signed up to use the app that is enabling users to adapt their behaviour and manage daily activities to improve their quality of life. The app has helped users to better manage medication, change their exercise pattern and influence their participation in activities and events during environmental conditions that could be harmful to their health. This Project strongly demonstrated how the federation of data can be used to improve individual and public health outcomes and create real impact within the community. 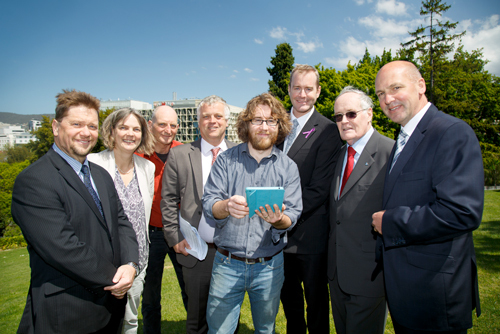 AirRater smartphone app launch October 2015: Dr. Stephen Cahoon, Sense-T; Dr. Fay Johnston, Menzies; Professor David Bowman; Professor David Sadler, Deputy Vice-Chancellor (Students and Education); app developer Chris Lucani; State Minister for Health, the Hon. Michael Ferguson MP; Asthma Foundation of Tasmania Chairman, Kevin Morgan; President of the Senate, Senator the Hon. Stephen Parry. The AirRater project involved two concurrent streams. Equipment was installed around Tasmania to capture information on temperature and air pollution (in the form of pollen, smoke and some gasses). The information was gathered in near real-time and fed back to a central database. At the same time, Tasmanians were encouraged to use the free Sense-T AirRater smartphone app to report their daily symptoms of asthma, allergies and hay fever. Once users entered this information, they were given a reading of the current levels of potential triggers in their immediate area. Over time, an individualised report was generated showing each user how environmental conditions impacted their symptoms, and then provided an alert when conditions existed or were forecasted. This allowed users to manage their daily activities and improve their quality of life. The sensor network also supports community-wide air pollution health advisories, heatwave forecasting and alerts, and fire weather mapping to assist firefighters, landowners and government. The team consisted of leading researchers in the fields of environmental health, with specialities in air pollution, pollen, smoke and heat. The Project was a collaboration between Sense-T, Menzies Institute for Medical Research, UTAS School of Biological Sciences, the Tasmanian Environmental Protection Agency, CSIRO, ANU and the Tasmanian Department of Health and Human Services. A key ingredient in the success of the project was the involvement of all Tasmanians who have asthma and hay fever.